Developed to the north-east of Brisbane city, the Valley began life as a separate European settlement. Easily accessible by tram by the 1890s, the Valley, which was not flood-prone, had the largest department stores. These did not survive the rise of the car-based shopping centres, whereas the city proper managed to retain some of its department stores. The Valley experienced an urban renaissance in the 1980s and 1990s, when young people flocked to new night clubs, some in place of the brothels and illegal gambling joints of an earlier era. In the mid-1840s the Presbyterian clergyman, John Dunmore Lang promoted assisted immigration as a means of relieving Britain's impoverished classes. Acting in the belief that the government had agreed to grant the emigrants free land, Lang arranged the first of three shiploads to come to Moreton Bay. The first vessel, the Fortitude, arrived at Brisbane in January 1849. The free land was refused, but the new arrivals were given permission to set up a temporary village at Yorks Hollow waterholes, an area now enclosed by Victoria Park and the Exhibition reserve. The waterholes ran between Gilchrist Avenue and the Exhibition railway line, putting the village in present-day Herston. The temporary abode gave rise to the name 'Fortitude Valley'. At the time of its European settlement, Fortitude Valley was a distant settlement from Brisbane, separated by hilly terrain, notably Duncans Hill along Ann Street where All Hallows College is now situated. By the late 1850s Fortitude Valley had some 100 to 150 houses. The first known evidence of civic life was the opening of a church house at the corner of Ann and Ballow Streets in 1856-57. 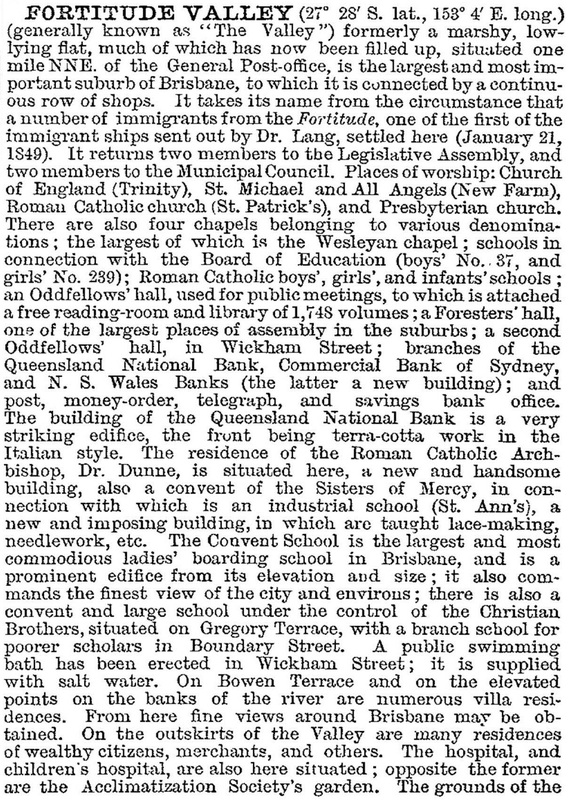 By the early 1860s there were a Primitive Methodist church, a primary school (1861), a free reading room and a locally-supported Alderman on the Brisbane town council. Alderman Warren soon organised a petition for municipal separation which, although refused, led to the creation of a separate Valley Ward (1864). The Valley, as it was becoming known, achieved a measure of commercial importance in 1864 when Thomas Finney bought a drapery business in Ann Street, the beginning of the Finney, Isles and Co department store (later in Queen Street, where David Jones took over the firm). During the 1870s and 1880s Church of England and Wesleyan churches were erected around the intersection of Wickham and Brookes Streets, and a Catholic church at Morgan Street. An extensive drainage scheme was constructed between 1879 and 1886. At Duncans Hill the All Hallows School (later a girls' industrial school) opened. 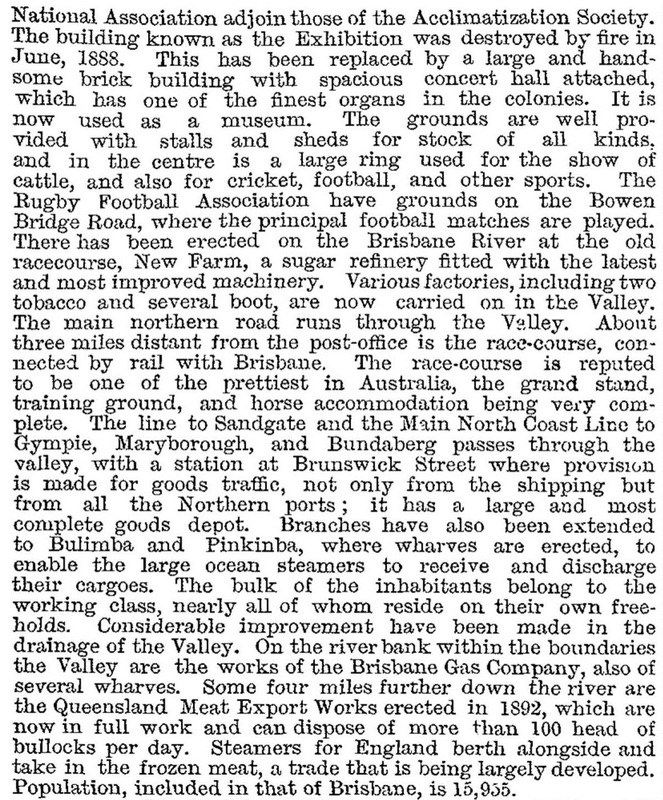 Brisbane's first railway line (1882), from Roma Street to Sandgate, skirted the Valley, to avoid tunnelling. Roma Street to Brisbane Central opened in 1889, the Brunswick Street station in 1890. Trams offered the main means of access to the Valley. Horse-drawn services from North Quay to the Exhibition grounds and to Breakfast Creek Road were opened in 1885. Fortitude Valley's rising commercial importance was best signified by the Renaissance style post office built in Ann Street in 1887. Thomas Finney's drapery store had grown and several significant retail establishments congregated around Brunswick and Wickham Streets: Overells in Ann Street (1883), which moved to Brunswick Street in 1899; T.C. Beirne in Brunswick Street (1891); and McWhirter's at the corner of Brunswick and Wickham Streets (1898), crowning the site with a new art deco building in 1930. Completing the group was Foy and Gibsons in Wickham Street (1903). All became department stores. The new shopping area was above the 1890 flood level, in contrast to central and South Brisbane. Most of the population, estimated at nearly 16,000, lived closer in, but seldom in villa residences. Mostly working class, they protested against unemployment in 1905-06. As if to emphasise the difficult social conditions, bubonic plague was reported in 1907. Electric trams were introduced in the 1890s and services from Hamilton and Clayfield soon followed, via Breakfast Creek Road; from New Farm via Brunswick Street; and from Kedron and Windsor via Bowen Bridge and Brunswick Street. It was a 'city centre' outside the city. The group of department stores maintained the Valley's retail importance for decades. There were additions, in a minor key. Brisbane Cash and Carry (BCC) opened its first store in 1921 and Maurice Blackmore opened his first health food outlet in 1938, both in the Valley. Beyond the retail centre there were substantial factories and warehouses. Bulimba Brewery, which had moved to the corner of Martin and Brunswick Street (1906), Sachs and Co ironmongery and kitchenware (1896), DP (Dinmore Pottery) Hardware, William Brooks and Smith and Paterson (printers), and Owen Gardner cordials and aerated waters. In the 1950s major retail chains from Melbourne and Sydney began to take over Brisbane and Valley department stores. Their main interest was central Brisbane. Foys fell victim to the 1961 credit squeeze. The Valley's retail strength was dissipated as the retail anchors were closed or let go. Where once the tram brought shoppers into the Valley from Kedron and Chermside, after 1957 they took shoppers out to Allan and Stark's Chermside drive-in shopping centre. Industrial sites began to be too small for modern industrial and warehousing methods, and some premises became affordable as galleries and for semi-retail occupations. Local employment dried up as people were attracted to the outer suburbs. In the 1980s Fortitude Valley was caught between a faded past and an uncertain future. The Whisky Au Go Go nightclub arson attack in 1973, in which 15 lives were lost, lived on in many people's memories, a reminder of just how seedy the Valley had become. The Chinatown Mall (1987) capitalised on an aspect of the Valley's cultural tradition. The Valley Fiesta (1993) drew on the suburb's reputation for exuberant entertainment. The McWhirter's store reopened as Festive Markets (1989, later named Urban Markets) and the Valley Centre Plaza opened on an adjoining corner. At the northern end of Fortitude Valley, at the junction of Ann and Wickham Streets, a derelict site was developed as the Citygate shopping area in 2001-05, with a number of furniture outlets and showrooms. The Valley was a middle-ranking retail area, known for Asian cuisine, entertainment and a fading history of illegal casinos, unlicensed night clubs and police corruption which had been revealed in the Fitzgerald Report (1989). There are 25 registered heritage sites in Fortitude Valley, some of them particularly grand examples such as the All Hallows convent and school (1850s, Ann Street), the Holy Trinity Anglican complex (1876, Church/Brookes Street), St Patrick's Catholic Church (1880, Morgan Street) and the Villa Maria hostel (1920, St Pauls Terrace). The TC Beirne and McWhirters department stores (1891, 1898, Brunswick and Wickham Streets) are heritage-listed, along with the primary school and police station in Brookes Street and the former post office of Victorian Italianate design in Ann Street. In 2013 the State government announced plans to close nine schools including Fortitude Valley State School. The school land was put up for sale in 2014. In January 2011 water from Breakfast Creek passed through Newstead and reached the north-east corner of Fortitude Valley at Montpellier Road and Wickham Street. During earlier floods such as those in February 1893, Fortitude Valley and Newstead were heavily affected. The Queensland Military Memorial Museum in Church Street, Fortitude Valley, contains over 2000 pieces of military memorabilia including artefacts dating back to the Napoleonic era. The basement museum is associated with the Victoria Barracks Historical Society but left that site in 1998. A fire in the Cathedral Place unit complex in Gotha and Ann Street in Fortitude Valley destroyed eight units and caused extensive damage in 2013. The spectacular population increase between 1996 and 2006 points to the Valley's rebirth as a residential area. In 2007-08 the state government invested in a major renovation of Brunswick Street station which extended to its name being changed to 'Fortitude Valley'. During 1891-1971 census records for Fortitude Valley included a much larger area.